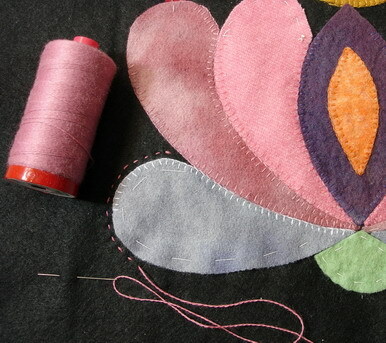 Following on from the mention of the Quilted Crow , a shop that specialises in wool fabrics and applique, in our last post I thought it was worth mentioning a few other sites that have great information for starting applique with wool fabrics. Paula, from Quiltmaker magazine, has put together a great tutorial about wool applique that can be found on the, “Quiltmaker Blog“. The instructions are well illustrated, and easy to follow, and include valuable tips about using paper backed fusibles. There are some more interesting ideas for holding the applique pieces to the backgound fabric on the “Quilt with Us” blog. And of course, don’t forget that the Lana thread from Aurifil is a perfect compliment to wool fabric. I love finding, & sharing, well written tutorials for textile techniques. Thank you for adding these very valuable tips.